A Terror Bird stands as tall as a Giant or higher, and is a highly aggressive carnivore. They travel in packs and have a very long aggro distance. 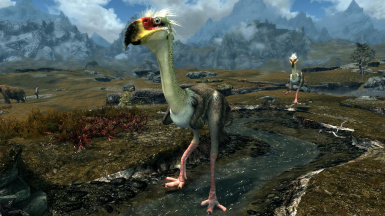 Unable to fly, they have evolved to sprint in pursuit of prey, cus that, Terror Birds have long legs and powerful hooked beaks designed to tear flesh and crush bone. 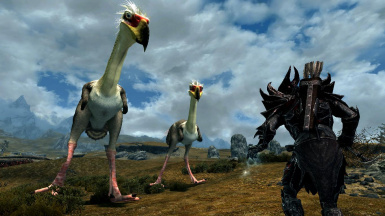 Racing across the plains of Skyrim, there are strange feathery shapes, taller than a man. 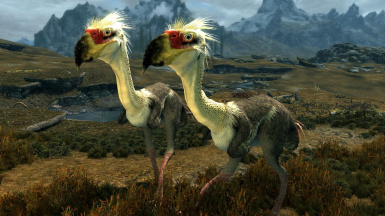 They peck and kick their prey to death with hooked beaks mounted on heads as big as that of a horse’s. 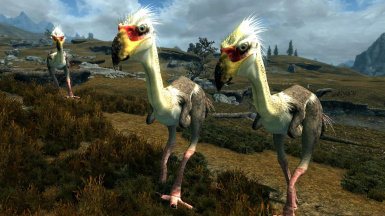 These are the terror birds, the dominant predator of the tundra. 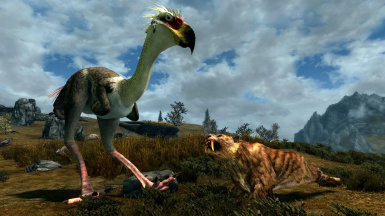 A Terror Bird stands as tall as a Giant or higher, and is a highly aggressive carnivore. Extremely Aggressive, they travel in packs and have a very long aggro distance. Having evolved to sprint in pursuit of small prey, Terror Birds have long legs and powerful hooked beaks designed to tear flesh and crush bone. They have traded the power of flight for this, having only vestigial wings, generally used for balance in high-speed chases in the Tundra. Because their aggressive behaviour, they are not easely tamed to be used as mounts. A regular non-aggressive mount will be added, but as a separate mod, and not now. Will come with saddle, and other stuff.